I'm thrilled to announce my appointment as Director of Music & Organist at St. Michael and All Angels Episcopal Church in Dallas TX. One of the largest Episcopal churches in the United States, I'll oversee and develop the church music program at St. Michael's, head the Saint Michael Presents concert series, and play the IV/94 Schudi, Op. 30 organ in the church and II/16 Letourneau Op. 84 organ in the Chapel. While I will miss my many friends and colleagues in New York and am grateful for 4 wonderful years at Christ Church Greenwich, I'm excited about this extraordinary opportunity. I begin in Dallas in early September. I was delighted to be joined by Todd Wilson in a live interview about Bach, Clavier-Übung III, and my recital at Trinity Cathedral, Cleveland on Cleveland's classical radio station, WCLV. Another interview was published here in ClevelandClassical.com. 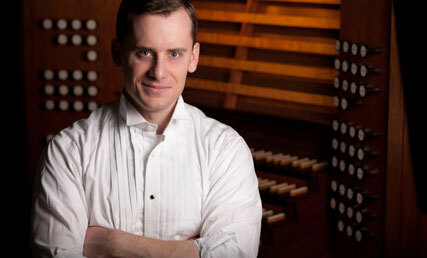 The online program At the Organ released an interview with me today. We discussed my background, how I first became interested in the organ, and my recording projects, including how "Influences" came to fruition. Listen to it here! I'm honored and excited that my recently released recording, Influences, is under consideration for a 2017 GRAMMY® award for best classical instrumental solo album. Announcing the release of my new recording! Entitled Influences, it features major works by Healey Willan and Marcel Dupré alongside a commissioned piece by renowned English composer Philip Moore, and a recording premiere by contemporary Dutch composer Ad Wammes. It's available for purchase on this website here and on iTunes. Learn more about it from this video. A recording release party and CD signing reception has been scheduled for Tuesday, December 22 in Greenwich, CT at 7:30 PM. It will feature special guest Philip Moore who will speak about his commissioned piece, Pastorale, before I give the world premiere performance. Read more about it in my Engagements page. I hope to see you there! I'm excited to announce a new solo recording project! Over 5 years in the making, it will center around music with a fusion of multiple styles, plus a newly and specially commissioned piece. After searching for the right instrument to bring such music to life, I’m delighted to travel to Dudelange, Luxembourg in between my North American and European summer engagements for recording sessions on the extraordinary organ at St. Martin’s. Repertoire will include the Symphonie-Passion, Op. 23 by Marcel Dupré, the Introduction, Passacaglia, and Fugue, Op. 149 by Healey Willan, the premiere recording of Ride in a High Speed Train by contemporary Dutch composer Ad Wammes, and a commissioned work by renowned English composer Philip Moore. A 30-day Kickstarter has been launched to help publicize and support this project. During these 30 days, I am also giving an opportunity to join me in my team for this project in greater ways! More about it here. This summer ranks as my busiest to date with performances at conventions and festivals in both the United States, Germany, and Switzerland. First is two identical, full-length solo concerts at the National Convention of the American Guild of Organists (AGO) in Boston on June 25 and 26, followed quickly by the annual summer Colloquium of the Church Music Association of America in Indianapolis from June 30 to July 7, at which I continue to serve as principal organist, including service playing and overseeing the organist pedagogy track, and, this year, as conductor of the women's advanced Gregorian chant schola. A few weeks later will see my next set of concerts in Germany, including a solo concert as part of the International Summer Organ Festival in Konstanz at the Münster (Cathedral) and a solo concert on the summer Orgelvespern series at the Dom (Cathedral) in Limburg. The last of my summer performances falls on August 15 at the National Convention of the Organ Historical Society (OHS) in Syracuse - the third solo concert I've performed at a national OHS convention. Only a few weeks later, I will return to Europe for my Swiss début concert on the Late Summer Concert series at the celebrated Fraumünster in Zürich. I'm very pleased to announce my appointment to the staff of the Music Department of Christ Church (Episcopal) in Greenwich, CT starting later this month. There, I will direct the church's semi-professional adult choir, the Christ Church Singers, work with and assist in directing the Choir of Men & Boys and the St. Cecilia Girls Choir, play the church's IV/92 Austin organ for services, and maintain close involvement in the church's concert series. I am excited to be part of this historic parish and its developed music program. This month marks the publishing of my move to the regular roster of Karen McFarlane Artists. Having begun representation by this prestigious concert management in October, 2009 as a competition winner, I am honored and delighted to continue performing under their auspices. Excerpts from my recently released recording, "A Cathedral's Voice," were featured on two nationally syndicated radio program this week: PipeDreams and With Heart and Voice. The Playlist for PipeDreams, which includes a link to hear the program, may be found here, and for With Heart and Voice, here. I am thrilled to announce the release of my début recording. Entitled "A Cathedral's Voice," it showcases the splendid new Parkey organ at the beautiful Cathedral of St. John Berchmans on the Raven label with a varied program including music by Byrd, J.S. Bach, Schumann, Oldroyd, Tournemire, Dupré, Shearing, Travis, and a newly commissioned piece by young American composer Zachary Wadsworth. The recording is available for purchase here. A promotional video may be found on the Media page or on YouTube. This summer marked my début concert tour of Germany with 9 recitals at major venues whose non-stop schedule took me to all corners of the country over the course of 25 days. Memories of exceptional beauty, breathtaking cathedrals, and warm hospitality will not soon fade away. Pictures will continue to be added to the 2010 to present photo page in the coming weeks as well as recordings on the Media page. A complete itinerary with recital programs may be viewed on the 2011 Engagements page. After months of design and editing, I am delighted to welcome you to my new website! Please feel free to explore the site, and visit again soon as the Performances, Photos, Media, and Acclaim pages are regularly updated. I hope to see you soon at an upcoming concert!